In the afternoon of Sunday 13 January 2019, during strong winds, and as a result of deterioration in the condition of some of the panels, the timber salt storage dome at a mine suffered a substantial collapse. The site was closed at the time and no injuries were sustained. The dome was installed in 1995 by Dome Corp Ltd using panels imported from the United States. Failure was initially in an area of panels that had previously been highlighted for replacement, where wet salt, which had spilled from the infeed conveyor, had accumulated on the top of the concrete perimeter wall and the lower wooden panels. This had led to rotting of the base rails and ply, which is considered to have detached from the sill plate under the pressure from the wind. All of the above are extreme conditions that are distinctive to this dome at the mine site. The incident is under investigation by the Health and Safety Executive (HSE). 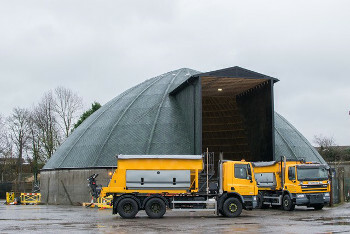 Being knowledgeable in the design and maintenance of this style of storage building, Eurodome Ltd has been asked to assist in the study and to communicate the incident with the winter maintenance sector in the UK. In order to ensure the long life of structures of this type (and that they remain watertight) it is crucial that they are regularly inspected and repaired competently. The HSE is recommending that all those responsible for wooden Dome Structures immediately carry out a ground level inspection of their dome style barns. If there are any signs of leaks, panel damage, rotting or broken rails and members, a competent company should be employed to carry out a detailed inspection, both at ground and high level. To ensure the structural integrity of the building is maintained, a company experienced in wooden salt dome maintenance should carry out any subsequent repairs. Guidance on what to look for in an inspection can be obtained from the Eurodome website. The frequency of inspection depends on the age of the structure, together with the use, condition and environmental conditions around the barn but in our view inspection should be carried out at least annually. It should be noted that when properly inspected and maintained, the Eurodome Salt Barn has a service lifetime of 30-50 years. Eurodome Ltd is also on hand to support owners with any inspection or maintenance questions they may have.